After an uneventful journey on the overnight train to Nong Khai, I met up with Nai and we decided to stay in the small border city for a few days before going to Laos. At the moment, I’m in Vientiane, and I still haven’t decided whether to venture up to Vang Vieng or to go back to Bangkok tomorrow and then to either Phuket or Hua Hin to take in a few days at the beach. Nong Khai hasn’t changed all that much, unlike Bangkok, which has dozens of new buildings going up and old ones being torn down; the skyline seems to be in a constant flux, undecided as to what face it wants to show. Everything is open again, at least those places not destroyed by arson in the recent protests. There are very few signs of the trouble, though a cleaning man pointed out a couple of bullet holes in the metal railing of one of the skywalks near Central World, courtesy of the Thai army, he told me. Vientiane is also seeing a lot of activity, with new construction going on in the city itself and along the banks of the Mekong, where a new waterfront park is slowly taking shape. It’s been very dry and hot here, though we’re getting a bit of rain this morning. I’m not sure where my next post will be from, but I’ll certainly have more later. Last week and the week before, I managed to wade through all the interviews, exams and paperwork associated with the end of a semester, and now I couldn’t be farther from that atmosphere. I’m writing this post sitting in an outdoor bar/restaurant in Bangkok on one of the side streets of Sukhumvit Road, one of the main thoroughfares and tourist areas of The Big Mango. I said goodbye to each of my classes and most of my students were happy to see me go, ummm . . . , that is to say, they wished me well on my vacation. If you’re interested, you can view the class photos I took here. When I left Incheon Airport yesterday, it was raining and had been doing so for hours. Bangkok, in contrast, was sunny, humid and hot. When I walked out of air-conditioned Suvarnabhumi Airport, I was smacked in the face with the sights, sounds, smells, and feelings of Bangkok. I suppose it was more like my senses being eveloped by a big, wet dish rag as I was immediately soaking with sweat. However, it was not an unfamiliar nor unpleasant feeling, but more like a welcoming one. For those who’ve never visited Thailand before, the impression can be overwhelming and off-putting, or addicting. I’m addicted. The best time to see the city is in the early morning, before all the hustle and bustle begins and when it’s still fairly cool. 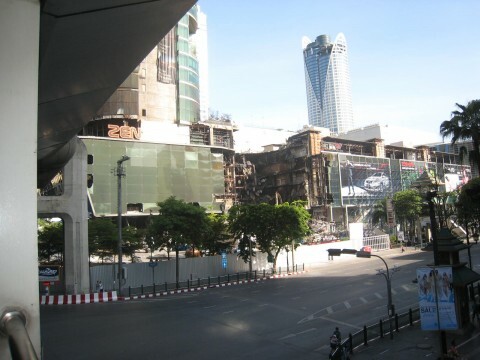 That’s what I did today, taking the sky train a few stops up Sukhumvit from the Nana stop, where my hotel is located, then walking to the MBK (Mahboonkrong) shopping mall, with time out to take a few photos of the Central World mall, site of a huge fire during the recent protests. Here’s a shot of the former Zen World, an upscale portion of the huge mall. This one’s from my compact digital cam, and when I return to Korea, I’ll post some from the big DSLR. It was a nice walk, with the only bummer being that I lost my Mio watch, which has a built-in heart-rate monitor, timer, and calorie counter. It cost about $100 and it was great for jogging. The watchband had broken and I had put it in my bag where my camera was at. There was about 3/4 of the band still attached to the watch, and when I took out the camera, the band must have hooked onto the camera strap and then fallen to the ground unnoticed by me. I’ll probably order a new one from Amazon.com. In the meantime, I’ll get a cheap timepiece here. In fact, I saw a street vendor who is selling Rolexes for $20. Wow, what a great deal! I’m taking the train to Nong Khai tomorrow evening to go see Nai. I’ll post more later. We’re elbow deep in final exams and paperwork. Today and Thursday I have 3-and-a-half hour morning-to-afternoon sessions (11-2:30) sitting at a desk and giving final 5-minute, individual oral interviews to all of my students, asking the same questions over and over, ad infinitum, a boring and ineffective way of measuring student progress, in my opinion. Korean administrators seem to love this particular version of hell, since I had to do the same thing when I was in Andong. At least we have tomorrow, Election Day, off, more or less (we still have to make up the hours–sheesh). Then, there is more classroom assessment at the end of the week and into next week and more paperwork to submit and entries to make into the online grading system and . . . well, you get the picture. Eventually, it’ll all be finished near the end of next week, and then we have three weeks off. I’ll be off, of course, to Laos and Thailand. I did manage to go bicycle riding this past Sunday under clear, sunny skies with another teacher. We sped down the back way into the huge petro-chemical complex (we didn’t go in), made our way up and over a large hill that separates it from the rest of Yeosu, and out to the Soho Yacht Marina area, where we stopped and ate a quick snack at one of the many seafood restaurants that dot the area. Unfortunately, on the way back he got a flat tire (no spare) and we had to walk our bikes a mile or so to find a bike shop that was open. They got him up and running in no time flat and we were able to continue our ride without further difficulty. It’s about time that I get going to my early morning special intensive TOEIC classes (8 to 10 a.m.), where I can tell the students about their final exam (oral interviews, again) next week. More later.